New Element is a membership-based donor circle that is made up of young professionals ages 25 to 45. To be a member, individuals are recruited by the community, other New Element members, or McWane Science Center’s staff. 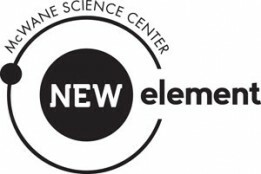 The purpose of New Element is to celebrate and promote science in our community while also helping advance McWane’s mission to provide outstanding experiences across the science, technology, engineering, and math spectrum that enhance subject matter literacy, creativity, and critical thinking. Engage in McWane and its programs whenever possible. Advocate our museum and programs to the wider public. Provide feedback, good and bad, to help create a stronger science center. Serve on the Beaker Bash committee—McWane’s annual fundraising event. Continue to give as annual donors to McWane Science Center. Help recruit additional New Element members to sustain and grow the group. *Recruitment Incentive-Recruit 5 first-time or lapsed New Element donors and receive a complimentary week of Summer or Winter Camp. Complimentary Beaker Bash Family 4-Pack of tickets—McWane’s annual family-friendly fundraising event. Invitations to member only previews and events. FREE admission to Adventure Halls for 12 months for all adults and grandchildren/children under the age of 18.